The style of British comics has changed many times over the years. 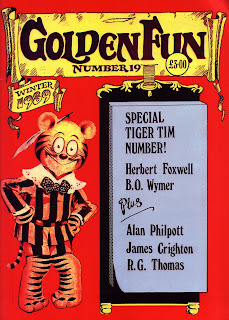 The type that we grew up with were the picture strip weeklies which were heavy on comic strip pages and light on non-strip pages, while today many British children's comics are light on comic strip pages and heavy on non-strip pages be they quiz, info or pin-up pages. While weekly humour comics always had a lot of comic strip pages, in the days before original Eagle appeared in 1950, boys weekly adventure comics were light on comic strip pages and heavy on text story pages and were known as "the story papers". Yet for most comics fans the story paper era is an all but forgotten mystery, dating as it does from the time when their grandparents were young, while the intervening years, as well as wartime paper recycling, have left few copies of the titles available for collectors to find. 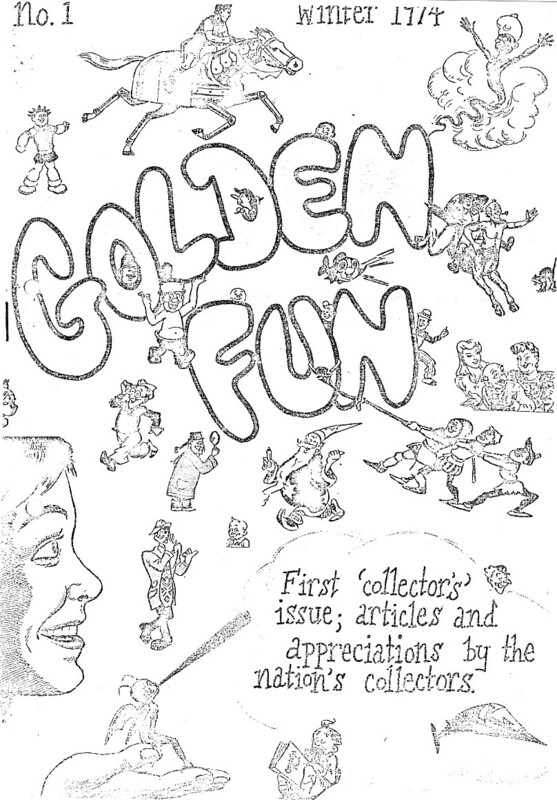 Information on them is equally hard to find and much of it comes from the older comics fanzines such as Alan Clark's Golden Fun which ran on and off for 19 issues between 1974 and 1989. Alan also wrote various comics reference books published in the 1980s and 1990s. So it came as something of a surprise that now, over twenty years after the last issue of Golden Fun appeared, Alan is back with a new comics fanzine entitled The Sloperian which concentrates on those early days of British comics. 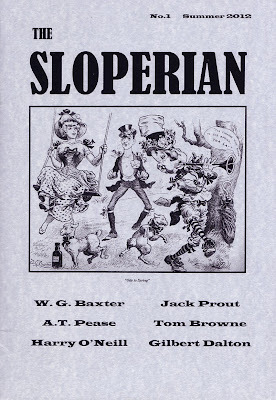 Taking its title from the first recurring British comics character, Ally Sloper, The Sloperian is an A4, mainly black and white, highly illustrated 44 page fanzine. 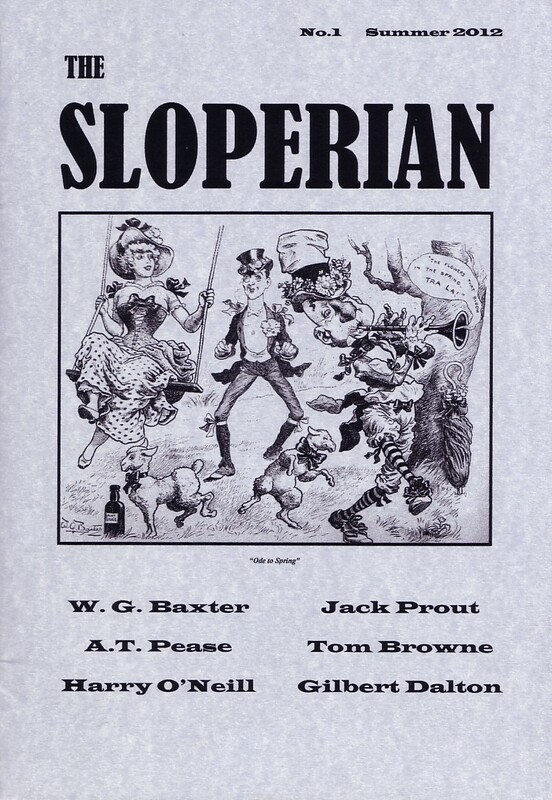 Issue 1 has articles on Ally Sloper artist WG Baxter, early 20th century humour artist Harry O'Neill, humour artist and scripter AT "Charlie" Pease, DC Thomson adventure writer Gilbert Dalton, Black Bob artist Jack Prout, and Illustrated Chips' various tramp characters. 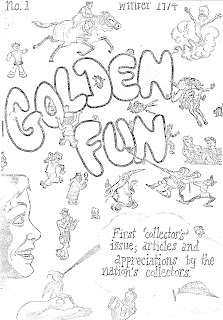 In its style and content issue 1 of The Sloperian is effectively issue 20 of Golden Fun and, like Golden Fun, it will be published occasionally. At the moment, The Sloperian is only available from Alan Clark via eBay and the cost is £5 including UK postage. Hopefully it will soon have a website or a blog that we can point you to but, until then, if this eBay link is outdated by the time you use it just try searching for 'Sloperian' on the sales site - we doubt that much else other than this fanzine will appear for that search. Immediate Media, the publishers of Doctor Who Adventures and more, is to launch Rastamouse magazine, a lively children’s title aimed at pre-schoolers, based on the popular CBeebies TV programme and books of the same name. 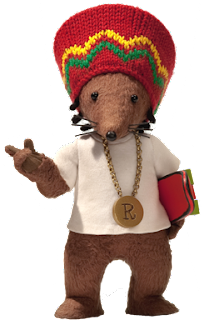 Following a deal with rights-owner DHX Media, pre-school smash favourite Rastamouse and his crime-busting mouse reggae band, The Easy Crew, will feature in a new four-weekly magazine for the UK, aimed at pre-school boys and girls from the age of four years upwards. The first issue will go on sale in early summer. Based on the successful books by Genevieve Webster and Michael De Souza, Rastamouse is a Cbeebies preschool hit features stories showing how people can get on and solve problems through understanding, love and respect. Rastamouse's ethos is to "make a bad ting good" to teach right from wrong, and help wrong-doers redeem themselves from their mistakes. Mackinnon & Saunders, whose credits include Pingu and Bob the Builder, made the puppets for this fun-filled and already classic series. Working closely with director Derek Mogford, the team adapted the designs from Webster and De Souza’s books into functional three dimensional puppets. Reflecting the slightly ‘tongue in cheek’ humour that runs through the programme, Rastamouse magazine will also have a strong appeal to an older audience and parents. Publishers Immediate Media say the new title is the only pre-school magazine that encourages children to investigate and solve a mystery and will encourage them to learn about respect, understanding and to foster self-confidence, through learning important detective skills whilst helping Rastamouse to solve a mystery. With stories, reward charts, stickers and incentives to make a bad ‘ting good, the magazine will contain activities for children to cut out and make. The editorial will be relaxed, chilled and very positive, helping children to feel they are part of the crime-fighting, mystery-solving team. • Rastamouse magazine will be priced at £2.50 and will be available at all major retailers and independents around the UK this summer. With news on the latest issues of DC Thomson's war comic Commando comes news of a another change to its format - this time, not just in its branding, but actual look and feel. "This has resulted in a thicker weightier Commando which we feel (and initial feedback reinforces) better suits a product of Commando's quality" says editor Calum Laird. "We hope that our fans will like the change. They can let us know what they think through our Facebook page." 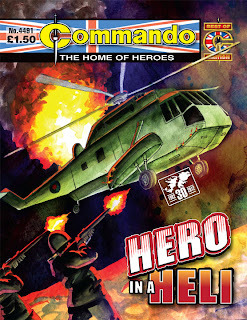 The second in Commando's mini-series of Falklands tales 30 years on. It takes nerve and skill to hold a bucking, weaving Sea King in position over a casualty while one of your crewmates is winched down to try to pluck him to safety. Lieutenant Jamie Price had both these qualities which helped make his crew one of the best in the business. Yet his brother Owen, a Sea Harrier pilot, ranked him only as a glorified bus driver, never missing a chance to sneer. He never dreamt that he'd have to trust his life to that bus driver in the hostile skies over the Falklands Islands. So how did it come to pass that Warrant Officer Greg Blake was about to take on a menacing German Zeppelin during the First World War, armed with only a Martini-Henry rifle? 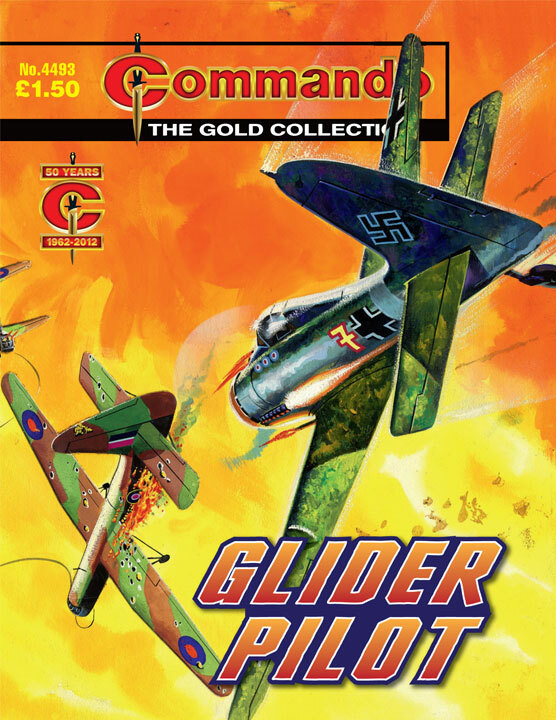 Like great birds of prey the gliders swoop into enemy territory, defying the might of the Luftwaffe and the savage assault of the flak batteries. Spoiler alert! 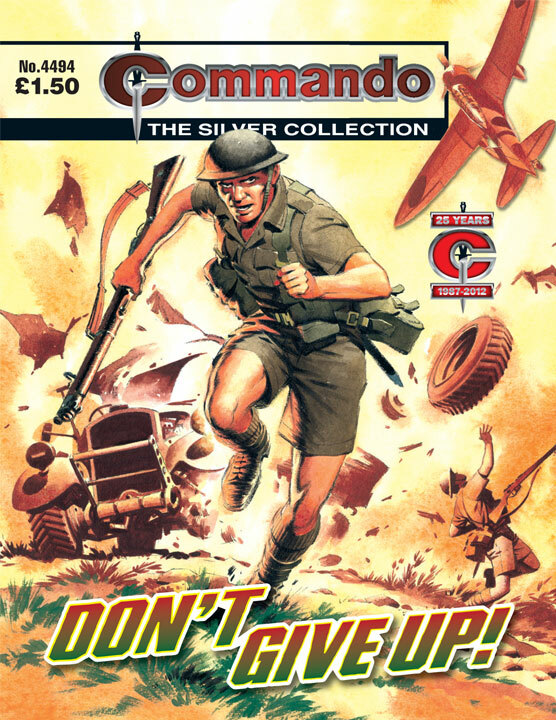 "In 1962, when this gold nugget was first unearthed, the plot device of the trainee who couldn't quite cut it was new to Commando," says editor Calum Laird, of this reprint isssue . "We've used it many times since, because it's still an excellent premise for a story. Eric Hebden makes fine use of it here. "The inside art by Bonato has a clean, clear line to help the story-telling. He's sparing in his backgrounds, keeping the emphasis where it should be, on the characters who are taking the fight to the enemy on his own ground. "You can't fault Ken Barr's cover composition or execution for drama and colour - no wonder the original title was so small, no-one wanted to cover any of it up." 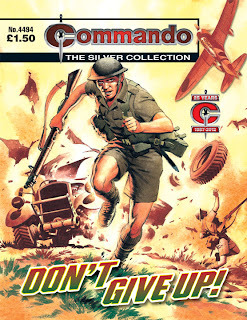 Commando No 4494 - Don't Give Up! As a Japanese dive-bomber roared in to destroy their trucks, a group of British soldiers scattered for cover. Every man knew they now faced a long trek through the Burmese jungle, trying desperately to stay ahead of the enemy advance. It wouldn't be easy, buy they must never give up. 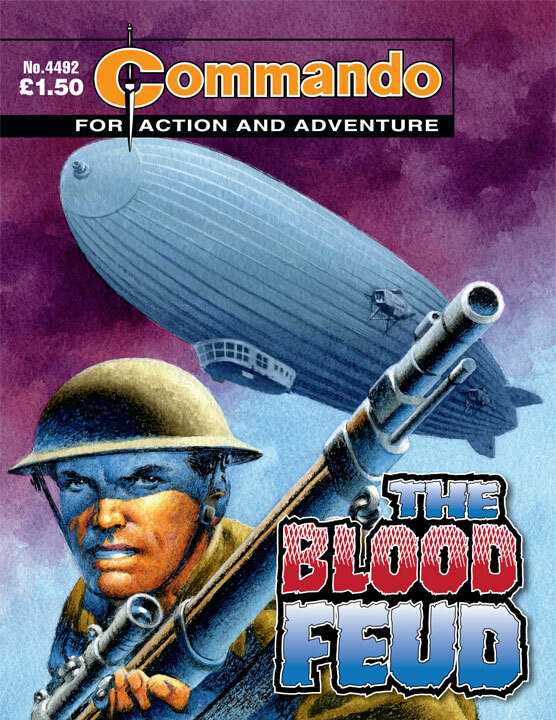 "Commando stories are fictional, of course. However, our tales do not shy away from the grimness of war, while still providing solid action yarns," says Deputy Editor Scott Montgomery. 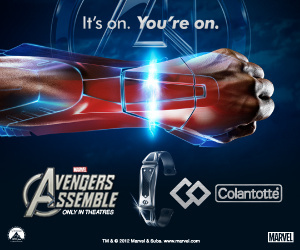 Marvel licensee Colantotte are giving UK comic fans the chance to win six of their limited edition Neo Legend wristbands, as featured in the new Avengers Assemble film. Colantotte created the exclusive limited edition MagTitan Neo Legend bracelet as worn by Tony Stark (Iron Man) played by Robert Downey Jr. in Marvel’s Avengers Assemble movie, which opens in the UK today (26th April 2012). The wristband, which you have the chance to win over on Facebook, is top secret gear Marvel's heroes used to maintain their edge while fighting off arch rivals on a new interactive website, introduces the Earth’s mightiest heroes. In Avengers Assemble, as with the comic that inspired it, iconic Marvel Super Heroes Iron Man, The Hulk, Thor, Captain America, Hawkeye and Black Widow join forces when an unexpected enemy emerges that threatens global safety and security. Nick Fury, Director of the international peacekeeping agency known as S.H.I.E.L.D., finds himself in need of a team to pull the world back from the brink of disaster. The film stars Robert Downey Jr., Chris Evans, Mark Ruffalo, Chris Hemsworth, Scarlett Johansson, Jeremy Renner and Samuel L. Jackson, and is directed by Joss Whedon. The Colantotte/Marvel’s Avengers Assemble microsite enables fans old and new to meet the entire superhero team and learn about each of their unique powers through their in-depth profiles. It includes exclusive interactive comics, andthe chance to follow all the Marvel’s Avengers Assemble content from across the web via the Super Social Link List. Colantotte’s MagTitan Neo Legend bracelet combines a polished pure titanium core with an embellished, sleek, carbon fibre design, to deliver a stylised element of comfort and functionality. This striking bracelet epitomises the essence of fashion and craftsmanship which makes it the ideal accessory for casual, business, and superhero attire alike. The MagTitan Neo Legend is approved as a medical device by the Japanese Ministry of Health, Labour, and Welfare and features a unique Alternating North-South Polarity Orientation (ANSPO) technology to create a larger magnetic field flow. Colantotte International, Inc is Japan’s leading manufacturer of medically certified devices, Arc Quest Co. Ltd. Colantotte & Trion:Z launched its award-winning range of products in 1997 and is now a leader in providing magnetic ionic gear to the global health and fitness arena, with a presence in over 60 countries worldwide. Their products are worn by hundreds of professional athletes including those in Triathlon Sports, Cycling, Cricket, Football and Tennis. “We founded Colantotte in 1997 with the goal of providing the highest quality products to help restore the negative impact today’s lifestyle imposes,” said Katsumi Komatsu, President, Colantotte International Inc.
"After 15 years of doing just that, we are grateful to have been selected by Marvel to be involved in this Hollywood movie. We appreciate the support of our customers over the years and we hope they enjoy seeing the MagTitan Neo Legend in Marvel’s Avengers Assemble film and interacting with the Super Heroes on the website. • To win a Neo Legend Wristband Competition, go to www.facebook.com/ILoveTrionZ, click on the competition app, then submit your details and you’ll be rewarded with an exclusive 15% off all Colantotte and Trion:Z products, and have your name added to a prize draw to win one of six stunning Neo Legend wristbands, the same worn by Tony Stark (AKA Iron Man) in the new Avengers movie. 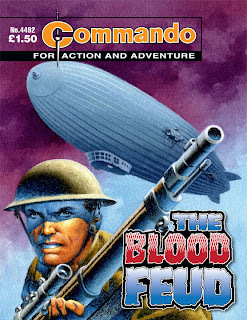 Renegade Arts Entertainment has just announced another Alan Grant-scribed project - this time with a historical setting rather than, perhaps, the horror and futuristic themes he might be better known for. 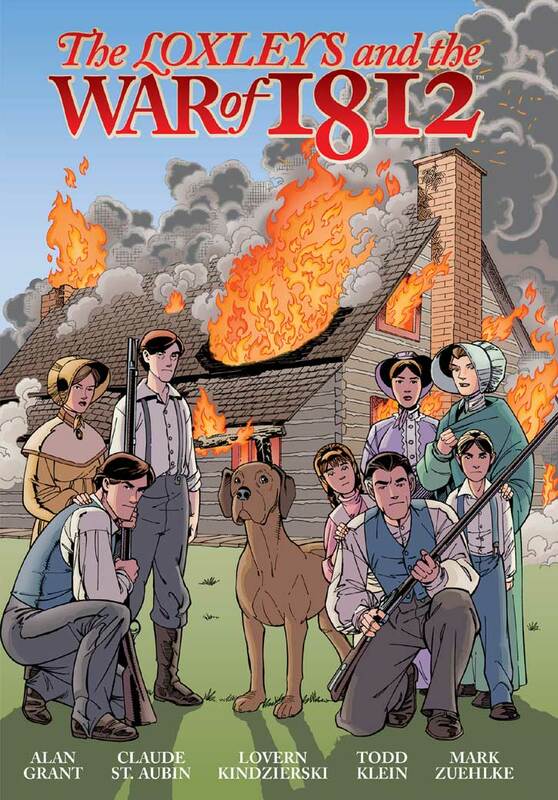 Due for release in June, The Loxley's and the War of 1812 is written by Grant, who has written several projects for Renegade, with art from Claude St Aubin (R.E.B.E.L.S., Batman: Turning Point) and Lovern Kindzierski (Animal Man). This paperback features a 101-page story about a Canadian family caught up in the war, as well as a 53-page summary of the war and its implications for Canada and America, written by acclaimed Canadian military historian Mark Zuehlke, presented with maps and illustrations. The story follows the Loxley’s, a Canadian family living in the Niagara peninsula as they're torn apart by the American invasion of Canada in 1812, and the subsequent war that raged across both countries as British troops, Canadian militia, and First Nation warriors sought to thwart the expansionist plans of the American government. The story follows the characters through key historical events as they deal with the realities of war on their doorstep, the personal loss, setbacks and victories tied into the conflict. In addition to the graphic novel, Renegade Arts Entertainment has also hired Oscar nominated screen writer Tab Murphy (Thundercats, Batman: Year One) to adapt the story into a school play, most recently performed at the Canada's Canmore Collegiate High School Theatre, as well as a movie screenplay. 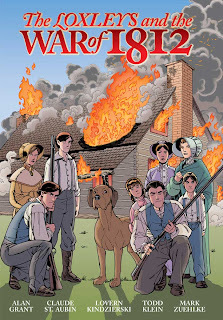 • The Loxley's and the War of 1812 will be on sale in UK comic shops June, 2012 for $19.99 US and is available to order in the April 2012 edition of Diamond Previews (APR121209, ISBN: 978-1-908217-04-1). Retailers receive one FREE copy for every three ordered. Want to discover comics and need a place to start? Then visit any branch of Forbidden Planet on 5th May - Free Comic Book Day. Free Comic Book Day is perfect for fans and newcomers alike – if you love the idea of comics, these are titles to give you a great taste of what’s waiting for you. You can join the comics revolution – discover comics for the first time or return to the fold to see what you’ve been missing. Forbidden Planet - the comics chain that has stores in London, Bristol and elsewhere - have bags of comics to give away that will provide you with a perfect jumping-in point, and they will be giving away loads of fantastic and cool titles to give away throughout the day. They've got goody bags for kids and for grown-ups; characters ranging from The Avengers to 2000AD, from DC’s The New 52 and Star Wars to Mouse Guard and Transformers, from Buffy to Donald Duck - but get there early, as stocks are limited. Please note that only comics marked as Free Comic Book Day titles are free of charge. 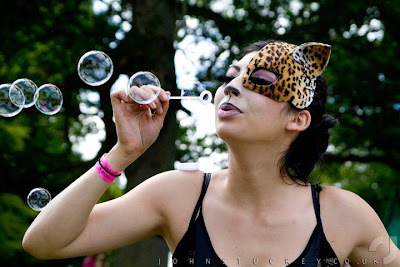 The massive music event Kendal Calling has just announced its the fancy dress theme for 2012 will be Fairy Tales and Comic Books, a magical all encompassing theme that will see the site transform on Saturday, with the entire congregation encouraged to get involved. Tickets have been getting snapped up for this year's festival and a full to bursting line up has already been unveiled that includes Dizzee Rascal, James, Maximo Park, Dan le Sac vs Scroobius Pip, We Are Scientists, The View and many more. For the third year, Kendal Calling reveal a fancy dress theme that has been a huge success in previous years with revellers showing incredible innovation and imagination in designing and donning costumes. "Getting dressed up for a festival is all about becoming another version of you," a spokesperson explains. "An exaggerated, bold and colourful character. So this year we are transforming the Deer Park into another world with our theme Fairy Tales and Comic Books." With the backdrop of the stunning Lake District, Kendal Calling expects to see everyone from the Pied Piper to Wolverine, Little Red Riding Hood to Catwoman, the Gingerbread to Tin Tin all partying together and this years theme will make the event even more of a surreal wonderland of fun and frolics than ever before. The fun and frolics continues at Kendal Calling in the crazy world of the Happy Slap Boutique. This area will be like no other and is where anything goes, and is the home of electro swing and eclectic music. A haven to transform into creatures and characters, the Happy Slap face-painting boutique will get revelers ready to be immersed in magical worlds, dazzled by spectacular cabaret shows, wowed by our travelling circus and entertained in ways you never thought possible. Happy Slap Boutique present a world of fairy tales and mischief full of secrets to explore and discover, keeping the entertainment going all weekend. Bump into Jack Sprat, a narcoleptic Sleeping Beauty or climb up Rapunzel's hair and witness their take on your classic fairy tales. Performers will be traveling around the festival doing walk-about performance where it’s least expected with music, song, dance and ridiculousness. As night falls, Happy Slap Boutique will transform into a plethora of circus, fire and glow performances alongside clowning, grotesque burlesque, world famous 'Rave Aerobics' and surprise acts that keep buzzing all night. DJs Ocelus, Tom Excell, Dan The Hat, Wolfie Rassmatazz, Magic Lantern, Vinyl Rights Experience, Mikey J and very special guests will spin a genre defying mix of electro swing, jungle, Balkan, breakbeat, house & electro. "The only music we can guarantee are upbeat party tunes," the organisers say. "Check out Happy Slap Radio for exclusive mixes." The music and activities in the Kendal Calling meadow span 11 diverse stages and areas, situated in a close-knit site that means you’re never far from your friends. • Kendal Calling, Friday 27th – Sunday 29th July 2012, Lowther Deer Park, Hackthorpe, The Lake District. Adults £105, £50 11-15 year-olds, under 11's free. Tickets available at www.ticketline.co.uk. (With thanks to Norman Boyd): New certificate level comics courses are starting at Birkbeck, University of London from this autumn. This module introduces you to a range of comics in a variety of forms and invites you to consider ways of understanding and evaluating them in their historical, cultural and generic contexts. We will trace a chronological trajectory from nineteenth-century newspaper strips, through the birth of the superhero, via the subversive iconography of the sixties undergrounds, onto the rise of the graphic novel and beyond. Focusing predominantly on Anglo-American comics, we will also consider the influence of other national traditions, principally francophone bande dessinée and Japanese manga. You will be encouraged to develop an understanding of comics in various forms and to situate them in their relevant contexts. This module closely examines the relevant contexts that have informed the development of comics. It is arranged thematically rather than chronologically, allowing you to focus on key areas and topics in comics, situating them historically and culturally while developing skills of formal analysis. You will explore themes including censorship and copyright, the growth of fan cultures, the importance of genres in comics history, non-fiction comics, and humour in comics. You will also consider the influence of key creators and international traditions. By adopting a thematic approach, you will be encouraged to develop an understanding and appreciation of comics and their various contexts. The Invisible Artist from Northern Visions NvTv on Vimeo. (with thanks to Andrew Luke): Northern Visions TV (NVTV), Greater Belfast's community TV station which backed the comics-related film The Invisible Artist last year, is under threat of closure because of controvrsial funding cuts. Northern Visions is a non-profit organisation originally formed in 1986, originally serving as a training ground for Belfast's local journalists and technicians wanting to make in-roads to working for Channel 4. Sometime after they metamorphisised into a sort-of public access station, giving an air to community voices in Northern Ireland's capital as it left the Troubles behind it. "Beneath all the gloss of the birthplace of the Titanic and the MTV awards, NVTV gave voice to real Belfast," feels viewer and comic creator Andrew Luke, who made The Invisible Artist documenatry with the support of the station. "And if you wanted to make a documentary, you'd get professional mentoring and assistance to write, film and edit. Post-production, the pieces were screened on local television and then made available for free on NVTV's spaces on Vimeo and Youtube." Sadly, one of the stations's main funding bodies has decided it no longer qualifies for ther financial support. During the 1990s NVTV were funded by the Arts Council NI, and from 2007 by film and digital body, NI Screen. Last month NVTV and the Arts Council were informed NVTV no longer fit NI Screen's criteria. The Arts Council had delegated their lottery funding to NI Screen, essentially blocking the station out of the revenue stream. Without this funding, there is no access for paid staff or volunteers to a central location, editing suite, or the other production costs. An emergency meet with the Arts Council last week for core funding ranked NVTV high with artistic Quality, Financial/Project Management, Preserve Frontline Services in the Arts, Key Components of Artform/Sector(non- duplication of Service/Provision) and in Innovation. However, the Arts Council disagreed with the Moderator's recommendation that NVTV is digital media and not the arts. "No funding streams (exist) for any form of activity based around access to and participation in film, new media arts for communities," notes Marilyn Hyndman of NVTV. "The central question remains which is - where do the communities Northern Visions work with fit within the arts, film and digital media – community groups, young people, older people, ethnic minorities, interface groups, local heritage groups, women, people with disabilities, victims of the Troubles, disadvantaged communities?" "I realise many of you have seen my own film," he says, "which would not have happened without station staff who kept the project turning. While my disabilities played up, producer Carl Boyle took over the final production in the editing suite. You no doubt found it an educational and representative piece, so please just drop a line and tell them what it meant to you." The campaign to reinstate funding is backed by North Belfast MP Nigel Dodds. "At a time when the Department of Culture, Arts & Leisure is advocating community based work in disadvantaged areas, it is a tragedy that an organisation of nearly 30 years standing, which has pioneered community digital media and community arts with hundreds of groups in socially disadvantaged areas or at risk of social exclusion should find that they too, are excluded," he said in a letter to Northern Ireland's First Minister. "I count on your leadership to preserve the only community digital media and arts resource of its kind in Northern Ireland." Over 100 groups each year benefit from Northern Visions services within the voluntary and community sector, the arts, film, music, vulnerable minorities, older people, victims of the Troubles, people with disabilities and minority ethnic groups. Its volunteer scheme involves over 125 active citizens and its seems to me that this is a service which has promoted the comics form – and will surely do so again – and deserves support. Charting the tales of those who ran Belfast's infamous grass-roots community club during the punk and new wave scenes of the 1980s. Vibrant, engaging, refreshing, fascinating. Valuable narratives, rare interviews and footage across four generations of families and friends at the city's beloved central market, St. George's. Before the machines and the tourists, labourers worked the Belfast dock-side and build up a community. This film reflects on another near forgotten age; those who remember the stories tell them. Documenting the relationships of two A graffiti artists, one from the Protestant Falls Road and the other, from the Catholic Shankhill. This film examines their friendship and collaborations in one another's areas as well as at John Lennon Roundabout, Liverpool. Lough Neagh boat enthusiasts talk about their development of traditional methods of building and sailing their craft. It's that time of year again when our domain provider seeks to extract a fair chunk of change from my wallet for hosting the main DTT site (www.downtetubes.net). Put together by volunteers to promote the British comic industy since 1999, we hope you enjoy our work (and thanks in particular to Jeremy Briggs for his major contribution to our ongoing editorial). While we do generate some revenue through Amazon links and Google ads, if you feel able to make a donation to help keep us afloat in difficult times, we'd be very grateful. You should be able to donate via the buttons below or donate via Paypal via johnfsfreemanATbtopenworld.com. If you'd like to contribute to our site by writing news stories or features, please also drop me a line! There's a massive amount of goings on in the world of British comics and we know we miss some! If you're planning on going to attend a comic convention or signing, or would like to submit reviews, have a look back through our posts to see how we format them. Transformers return, Marvel UK style! Picking up the story 21 years later, IDW Publishing, in association with Hasbro, has released more information about Transformers: Regeneration One, an all-new monthly series continuing from the original Generation One Transformers comics originally published by Marvel UK. IDW will kick off the event by offering fans a free Transformers: Regeneration One #80.5 for Free Comic Book Day, 5th May 2012, as a Gold Sponsorship comic - then continue with Transformers: Regeneration One #81 in July. 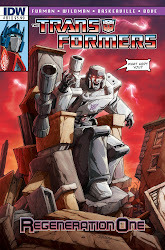 Writer Simon Furman and legendary Transformers artist Andrew Wildman (who will be signing at London's Orbital Comics on FCBD, see earlier story), are back to their original roots with all-new stories. Starting after 1991’s Transformers #80 comic epic conclusion, the free issue picks up as Optimus Prime watches over a Cybertron that hasn't faced Megatron for decades. But that peace shudders to an end and dives headlong into July's new series. Transformers: Regeneration One #81 comic will feature many fan-favourite Generation One Transformers characters including Optmus Prime, Grimlock, Kup, Rod, Ultra Magnus and more. 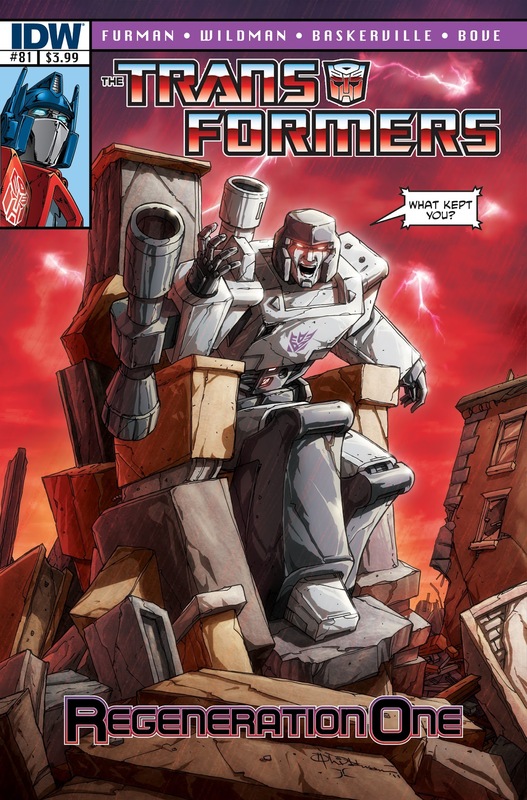 Marvel UK's licensed Transformers was one its most successful news stand tiles, running new stories originated for the UK market that writer Simon Furman carefully dovetailed into the US comic stories also published into the title. These early stories have since been re-published as albums by Titan Books. “It's always nice to complete unfinished business, even after 20 years,” says Andrew Wildman. Artist Stephen Baskerville, the original inker on the classic issues, joins Wildman on interiors as inker, as Wildman also provides eye-catching covers. - Transformers: Regeneration One #80.5 (Free, 32 pages; full colour) will be available on May 5, 2012 as part of Free Comic Book Day. Transformers: Regeneration One #81 ($3.99, 32 pages; full colour) will be available in July 2012. Visit IDWPublishing.com to sign up for updates and learn more about the company and its top-selling books.